Too much Office, not enough Workstation. 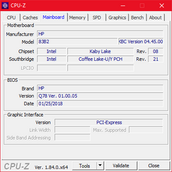 The ZBook 1xu series is at the lower end of HP workstation devices. 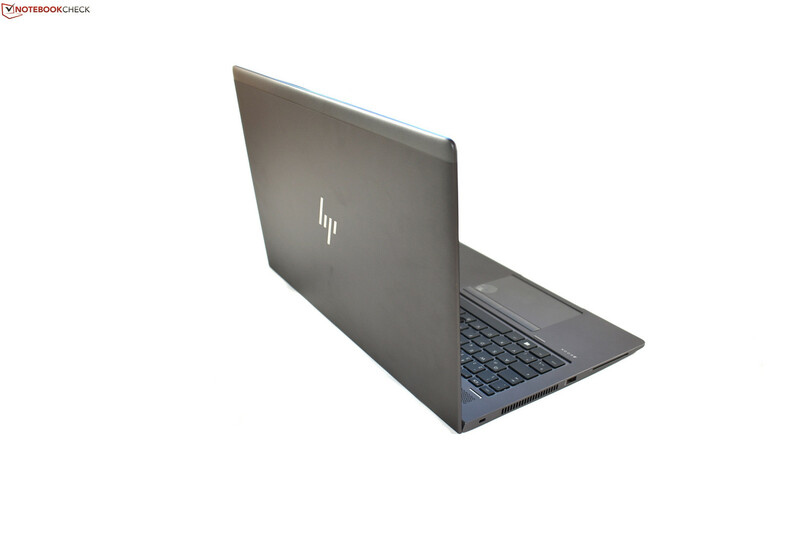 These models are based on the EliteBook to save costs. 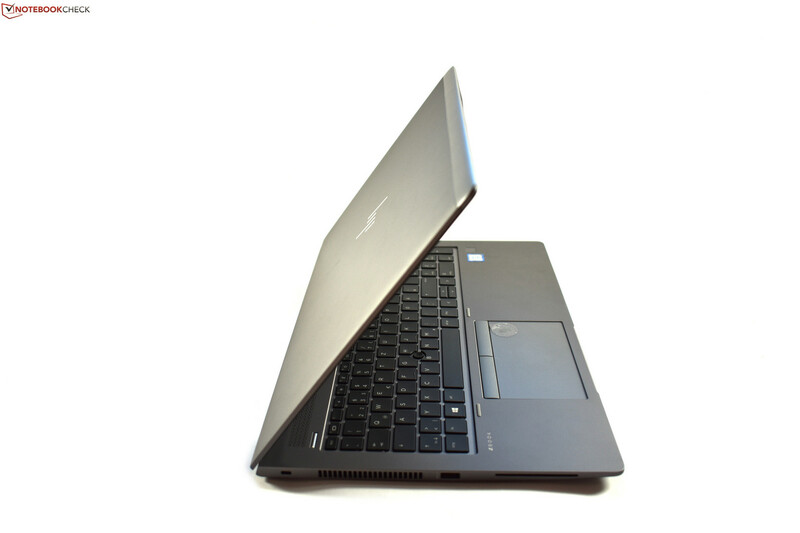 Find out in this review of the ZBook 15u G5 why this concept still doesn’t work. 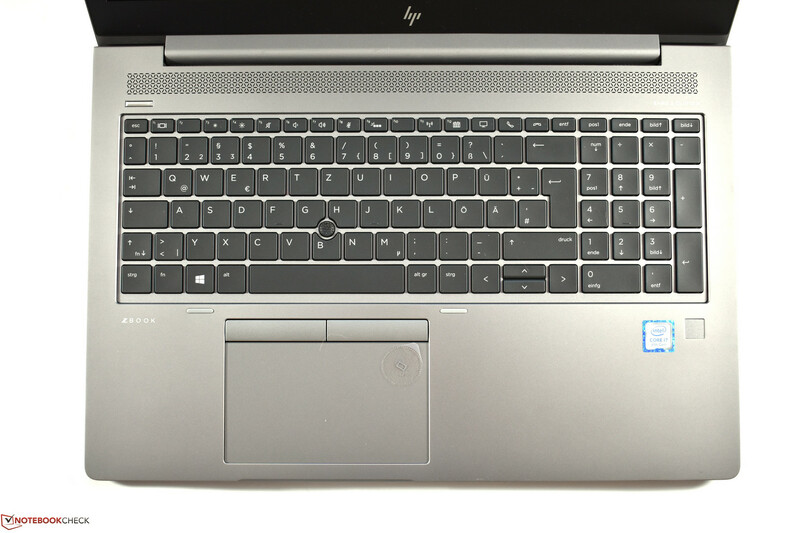 The ZBook name has been used with HP mobile workstations since superseding the EliteBook in 2013. The new brand survived the change from Hewlett-Packard to HP Inc. and quickly established itself as a mainstay of the workstation market. ZBooks became synonymous with combining high performance, good craftsmanship and HP’s excellent DreamColor displays. HP caters for more just the high-end though and launched the ZBook 1xu series for those who needed CAD-optimized GPUs but still wanted a power-efficient notebook. Our focus in this review is the ZBook 15u G5, one of HP’s latest offerings in its ZBook 1xu series. Devices of the 1xu series are traditionally equipped with power-efficient ULV dual-core processors. Combining dual-core processors with a workstation has left us unimpressed thus far. The release of Intel Kaby Lake Refresh CPUs could change this though by introducing quad-core computing to ULV processors. We will find out in this review whether these quad-core CPUs can bridge the gap between workstations and ULV processors. We will be comparing the ZBook 15u G5 against the ZBook 15u G4, the ZBook 15 G4, the HP EliteBook 850 G5 and the Lenovo ThinkPad P52s. We will be skipping the sections about the case, connectivity and input devices as they are largely identical to the EliteBook 850 G5. The ZBook 15u G5 has only two aesthetic differences from the EliteBook 850 G5: The ZBook 15u G5 comes in a darker color and naturally carries the ZBook logo rather than the EliteBook logo. 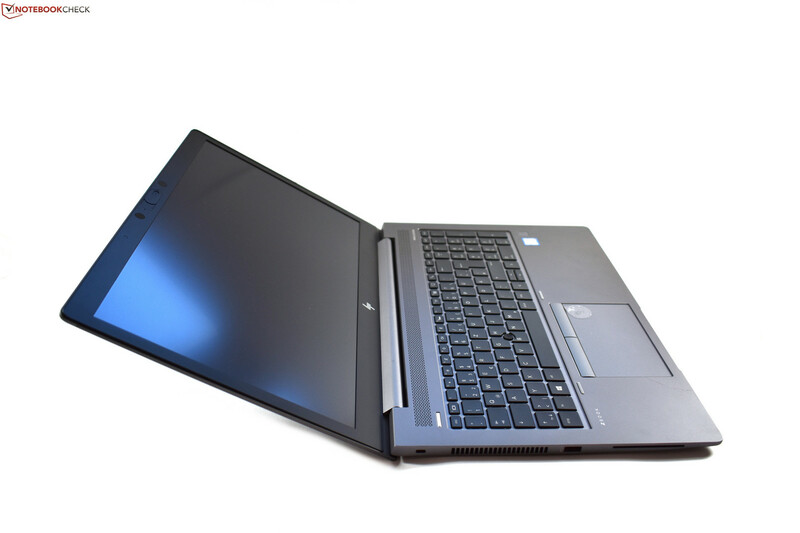 Information on these areas can be found in our EliteBook 850 G5 review. Our test device is a more affordable ZBook 15u G5 configuration. Our test device is equipped with an Intel Core i7-8550U processor, 8 GB RAM, a 256 GB SSD and an AMD Radeon Pro WX 3100 GPU. This configuration costs around 1,750 Euros (~$2,059). A second test unit was also provided by CUKUSA for us to double-check our benchmarks and results between two similar SKUs. The choice of displays is confusing, with HP offering several Full HD matte panels. 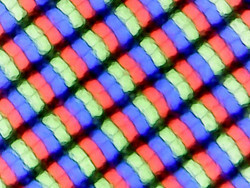 These 1920x1080 displays differ by brightness, the cheapest of which has an average maximum brightness of 220 cd/m², while the more expensive options are rated at 400 and 700 cd/m² respectively. 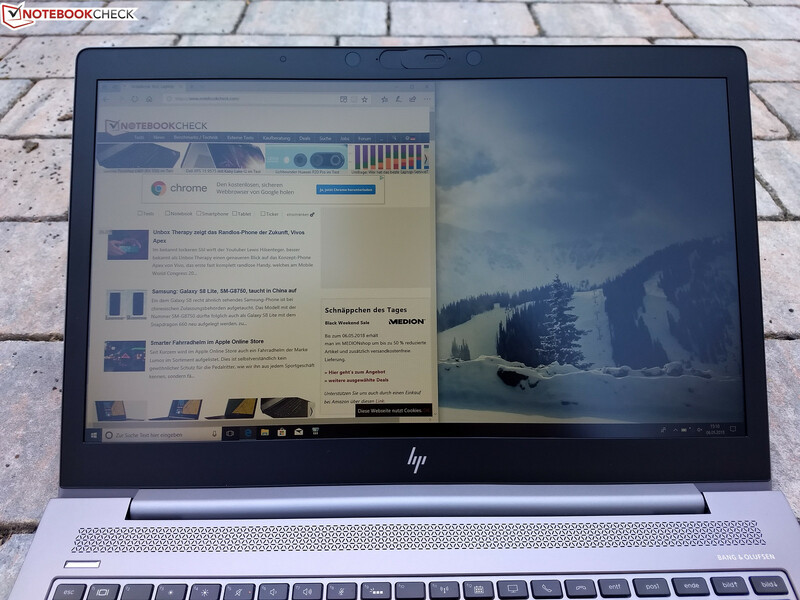 Incidentally, the brightest display is equipped with HP SureView, a privacy screen that we tested in our EliteBook 830 G5 review. 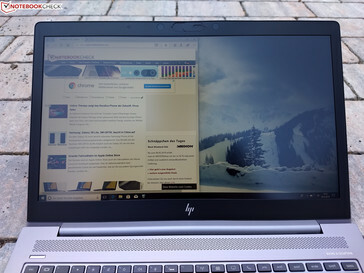 Further complicating things is the fact that HP also offers touchscreen variants, which have a glossy finish and a UHD display with a 3840x2160 resolution. 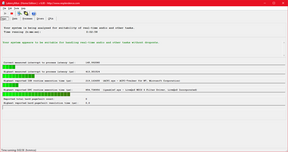 All display options are IPS based. The ZBook 15u G5 is only available with two display options in Germany currently. These are both 1080p options, the differences of which are barely noticeable to the untrained eye. 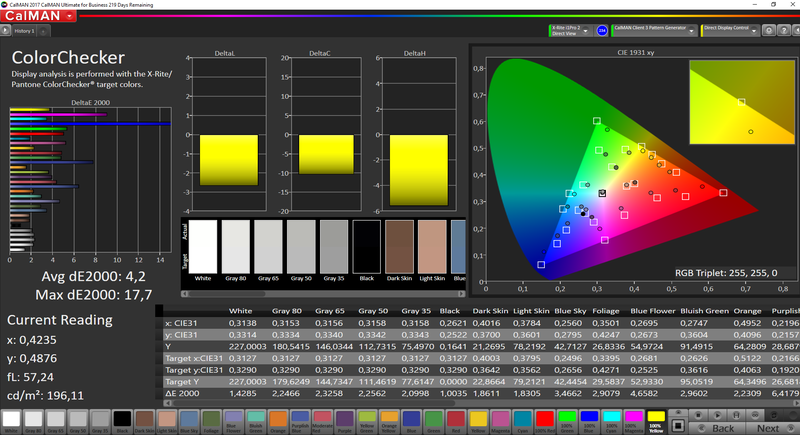 Our test device is equipped with the cheapest display, which HP promises will achieve 220 cd/m² brightness. We could only replicate that value at maximum brightness, with the average maximum brightness measuring at only 212 cd/m². 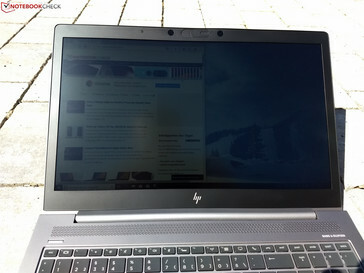 The cheapest display that HP offers with the ZBook 15u G5 is clearly a downgrade from the ZBook 15u G4, which had a display that averaged 310 cd/m². Likewise, the Lenovo ThinkPad P52s averages 284 cd/m², which while being darker than the ZBook 15u G4, is still significantly brighter than our test device. It’s odd that HP equipped the ZBook 15u G5 with a worse Full HD display than it did with the cheaper EliteBook 850 G5. 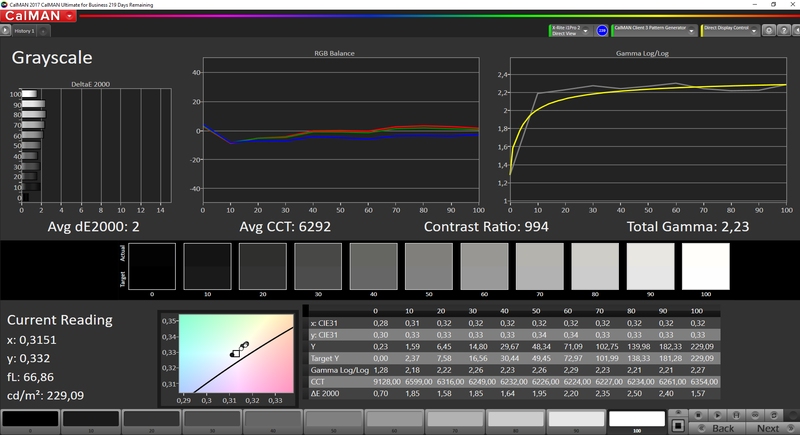 We measured brightness uniformity at 88%, which is 5% worse than the ZBook 15u G4 but is on par with comparable devices. Our test device exhibits barely any backlight bleeding either. 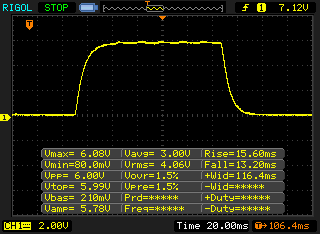 The display in our test device does use PWM to regulate display brightness at 40% brightness and below. 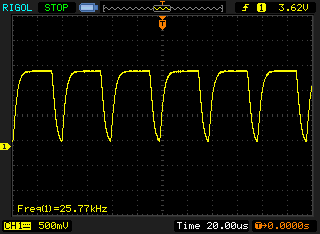 We measured PWM at 25,770 Hz, which should be a high enough frequency to not trouble those who are PWM-sensitive. The contrast ratio of 996:1 is good for a workstation at this price, thanks in part to the low 0.23 cd/m² black value. Our test device has no noticeable color cast and while there are slight saturation variations, we could not eliminate these with further calibration. 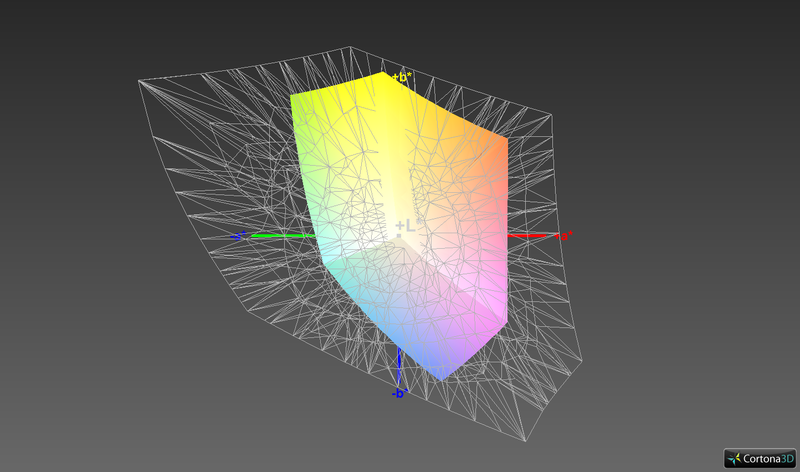 The color-space coverage is typical for a cheap display. 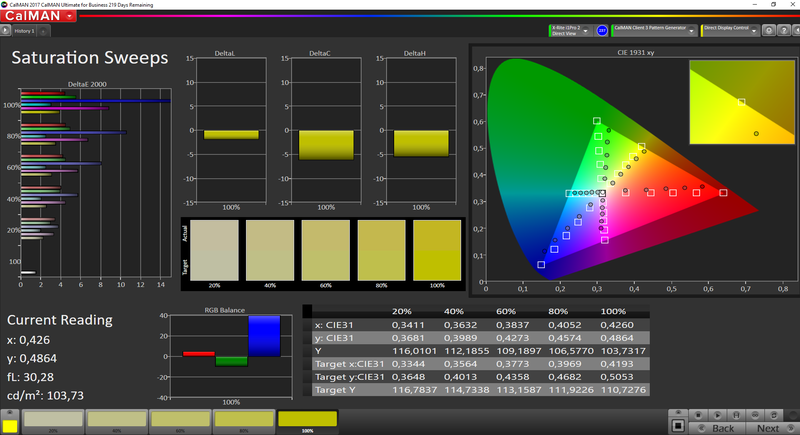 Our test device achieved 64.5% sRGB and 41% AdobeRGB, values which are too low for professional use. This may be tolerable for an office notebook but could be a problem for a workstation. 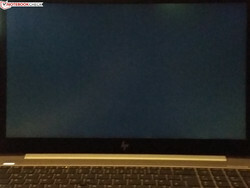 Why HP even offers such a poor display is a mystery to us. 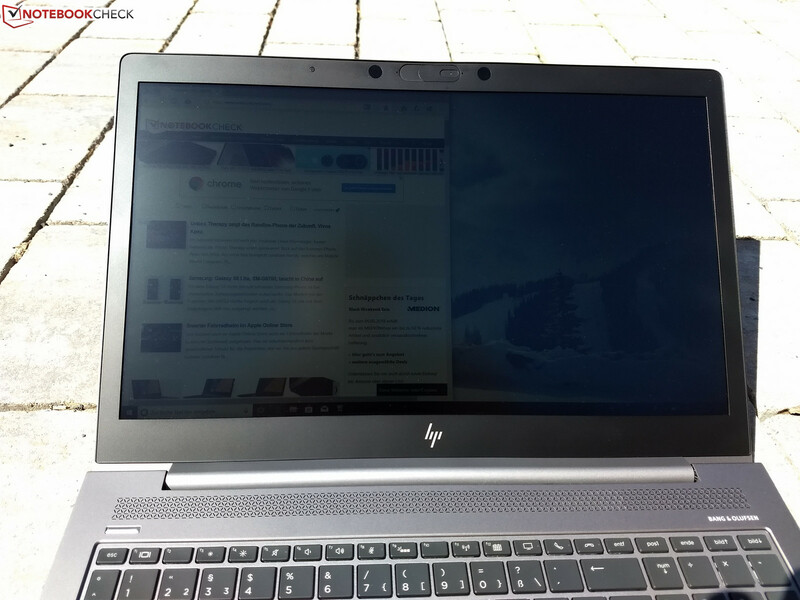 Our test device is difficult to use outside thanks to its low display brightness. The matte finish fails to provide a better experience even when trying to use the device in the shade. The cheapest display option is not one we would recommend if you frequently work outside. In comparison, all tested devices range from 0.9 (minimum) to 636 (maximum) ms. » 53 % of all devices are better. The display backlight flickers at 25770 Hz (Likely utilizing PWM) Flickering detected at a brightness setting of 40 % and below. There should be no flickering or PWM above this brightness setting. The frequency of 25770 Hz is quite high, so most users sensitive to PWM should not notice any flickering. 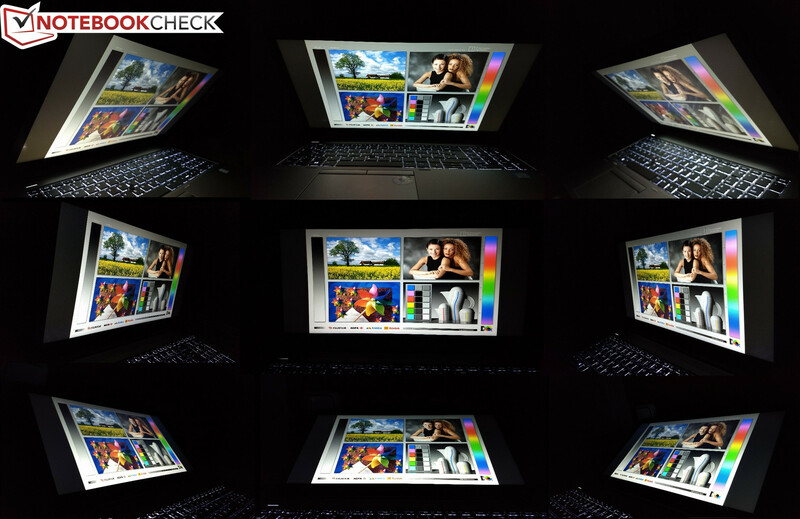 Our test device has strong viewing angles thanks to its IPS display. There are no brightness or color distortions even at acute angles. There are currently two versions of the ZBook 15u G5 that are available in Germany. We are testing the cheapest model, which is equipped with an Intel Core i7-8550U processor, an AMD Radeon Pro WX 3100 GPU, a 256 GB SSD and 8 GB DDR4 2400 RAM. There are two SO-DIMM RAM slots that support up to 32 GB of RAM. The 8 GB stock RAM occupies one slot. The other model costs between 200 and 300 Euros (~$235 and ~$353) more and offers more RAM and a larger SSD. The CPU and GPU remain the same, with the same GPU being offered across models including those currently unavailable in Germany. A third variant should be coming to Germany according to HP, but this is not yet available. This model will cost over 1,000 Euros (~$1,176) more than our test device and is equipped with an Intel Core i7-8650U processor, a 1 TB SSD and 32 GB RAM. The Intel Core i7-8550U is a ULV quad-core processor. The CPU has a 15 W thermal design power (TDP) by default. Workstations are generally equipped with at least 45 W processors. 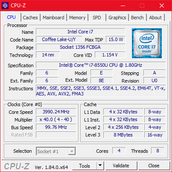 The Core i7-8550U has a 1.8 GHz base clock speed that can Turbo Boost up to 4 GHz when required. Please see our CPU benchmark page for a more detailed look at the Intel Core i7-8550U and its performance compared with other CPUs. In short, the CPU performance in our test device is disappointing. While the CPU can Turbo Boost up to 44 W, it can only do so for 28 seconds. Thereafter, the TDP drops to 15 W and the clock speed reduces from 3.7 GHz to between 2.3-2.4 GHz. 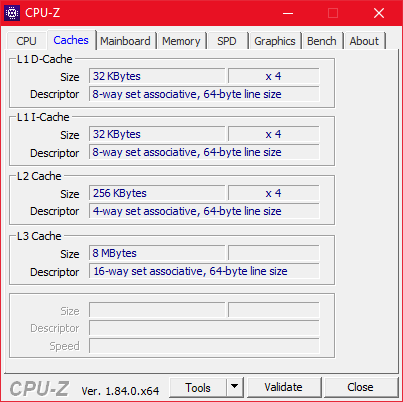 Our Cinebench R15 loop corresponds with this CPU behavior. Our test device initially scored 552 points in the multi-core test. This then decreased when the TDP returned to 15 W and scores stabilized at around 500 points for the remainder of the loop. While the ZBook 15u G5 is considerably faster than its predecessor, the 15u G5 performs below average in comparison to notebooks released in 2018. This is even more damning considering that the 15u G5 is a workstation as these are generally more powerful than their notebook counterparts. 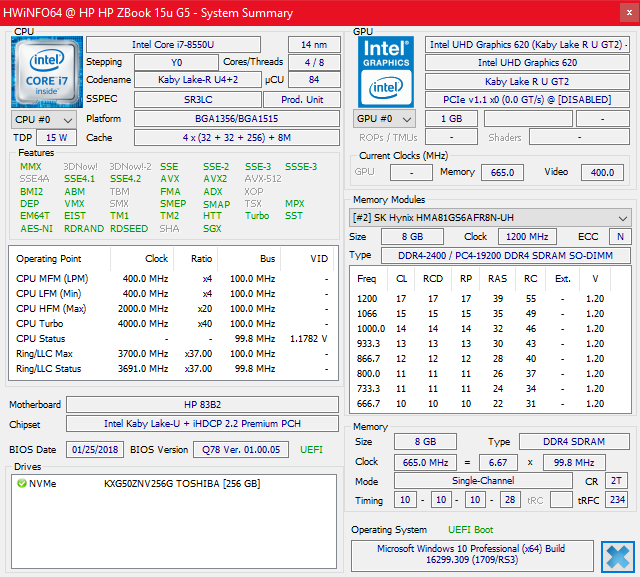 The ZBook 15u G5 is not only weak when compared with H-CPU powered laptops, but it is also weak against the i7-8550U-equipped Lenovo ThinkPad P52s. 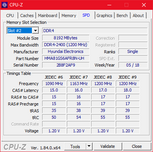 The ZBook 15u G5 is practically 30% slower than the ThinkPad P52s in benchmarks. The CPU is throttled out of the factory. 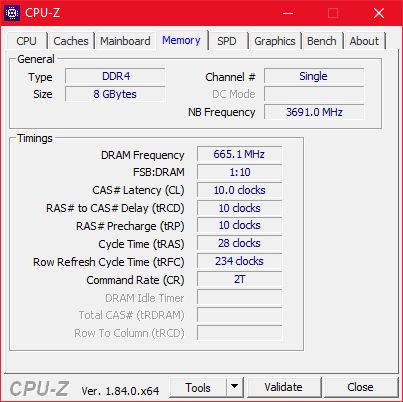 At factory settings, our test device only scored 421 points in Cinebench R15. This restriction can be removed in the BIOS as with all current HP EliteBooks and ZBooks. Our test device performed relatively poorly in the PCMark benchmarks. Other workstations are faster on average than the ZBook 15u G5. 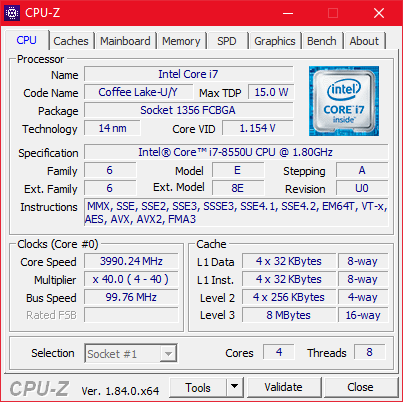 Worse still, even high-performance notebooks outperform the ZBook 15u G5. 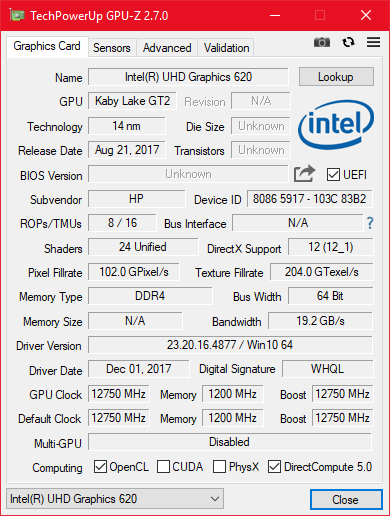 With that being said, the ZBook 15u G5 performs well in daily use and we had no problems with the system performance of our test device. Our test device is equipped with a Toshiba 256 GB SSD that has the model number XG5 KXG50ZNV256G. 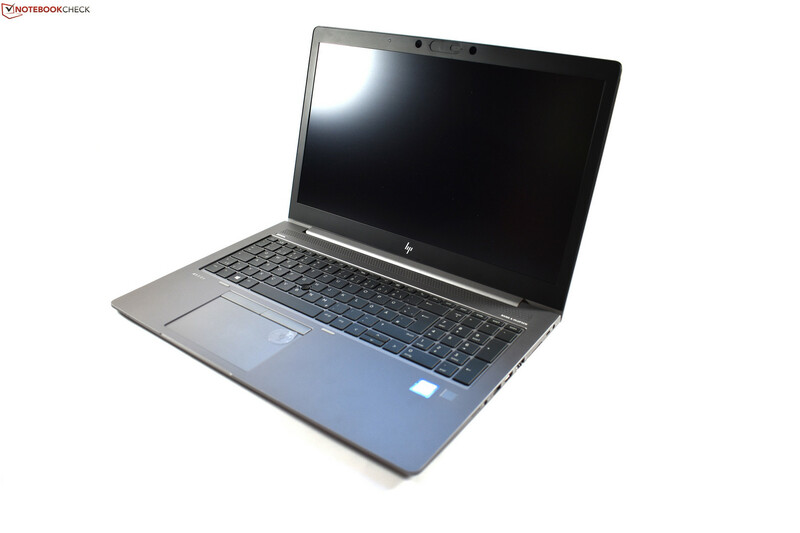 The XG5 is an M.2-2280 PCIe NVMe SSD that HP used in the EliteBook 850 G5. It is worth noting that the XG5 in the ZBook 15u G5 is faster than the one in its EliteBook sibling. The XG5 cannot keep pace with the Samsung SM961 though. 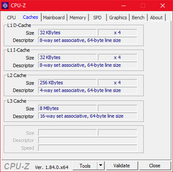 The ZBook 15u G5 is 59% and 71% slower in CrystalDiskMark 3.0 than the ZBook 15u G4 and the ZBook 15 G4, respectively, both of which are equipped with an SM961. The ZBook 15u G5 cannot accommodate multiple storage devices like its predecessor could. This won’t be a problem for most users, but workstations are equipped to different standards than typical notebooks. It would have been nice had HP added at least a second M.2-2280 slot. There is enough space in the case to accommodate this. People with greater requirements may need to resort to buying more expensive models like the ZBook Studio, the ZBook 15 or the ZBook 17. The AMD Radeon Pro WX 3100 replaces the outdated AMD FirePro W4190M that HP used in the ZBook 15u G4. The WX 3100 is based on AMD Polaris architecture, specifically the AMD Radeon RX 540. The WX 3100 runs in conjunction with Intel UHD Graphics 620 and only turns on when graphically demanding applications are running. Simpler GPU tasks are handled by the UHD Graphics 620. The AMD switchable graphics proved unreliable in our testing though. 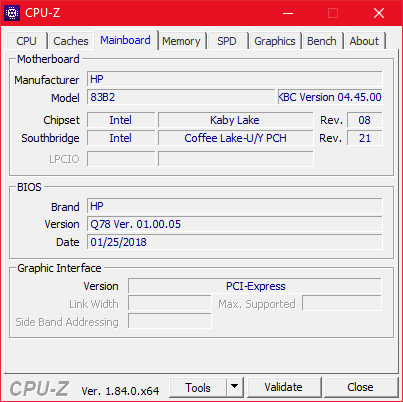 Even with benchmarks set to “high performance” mode in the AMD Control Center, they still ran on the Intel GPU rather than the AMD. Getting a benchmark to run with the AMD GPU seemed a case of more luck than judgment. The WX 3100 falls into the category of lower mid-range GPUs. The WX 3100’s main competitor is the Nvidia Quadro P500, which Lenovo has used in the ThinkPad P52s. The GPUs are typically matched in general and workstation benchmarks. The WX 3100 is around 20% ahead in some benchmarks whereas the Quadro P500 is slightly ahead in others. Both GPUs fail to compete against faster Quadro GPUs like the Nvidia Quadro M2200 found in the ZBook 15 G4. Oddly, the WX 3100 is outperformed by the AMD FirePro W4190M in certain professional benchmarks. We put this down to throttling though as the WX 3100 should be faster than its older sibling, which it is in 3DMark benchmarks. We will be discussing this topic in greater detail in our Gaming Performance and Temperature sections. While workstations and their dedicated GPUs are not designed with gaming in mind, it is still interesting to see how they handle modern games. We used The Witcher 3 at Ultra settings to test the GPU under load like we used Cinebench to test the CPU. GPU performance dropped by nearly 50% after a short time of running our test. This behavior is replicated in other game benchmarks too, with performance dropping significantly if we run benchmarks concurrently. This GPU behavior meant that we had to let our test device cool down before running the next game benchmark. The Radeon Pro WX 3100 has the potential to perform slightly worse than the Nvidia GeForce MX150, as the performance of the ThinkPad T580 in our comparison table demonstrates. The Radeon Pro WX 3100 is suitable for some gaming, but the GPU is restricted to running newer titles at lower resolutions and quality settings. 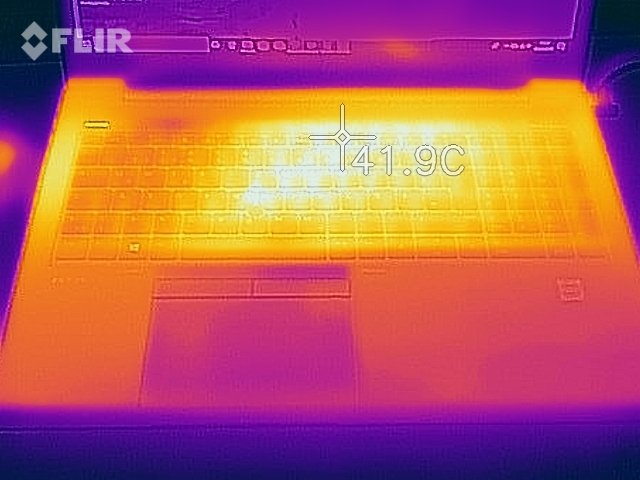 In short, the GPU throttles in the ZBook 15u G5 because of poor thermal management. The ZBook 15u G5 manages its fan poorly and in the same way as the EliteBook 850 G5. The ZBook 15u G5 fails to remain silent in everyday use, with the fan starting up with an even greater frequency under low load. The fan in our test device averaged 29.8 dB(A) at idle, which rose to an audible 36.5 dB(A) under load. The fan noise is rather high pitched, which we found annoying, particularly under load. Worse still, the fan occasionally sounds as if it is pulsing. HP needs to tune the fan behavior too. We noticed that the fan still runs long after we close a demanding application like a game. 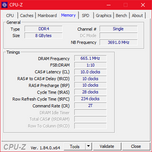 CPU load can even have returned to idle levels and the fan will still be running. Unfortunately, our test device has some coil whine that we could hear when we placed our ear directly above the keyboard. While this may not disturb all users, it would be better had HP eliminated this completely. On the plus side, the ZBook 15u G5 is a comparatively cool device. 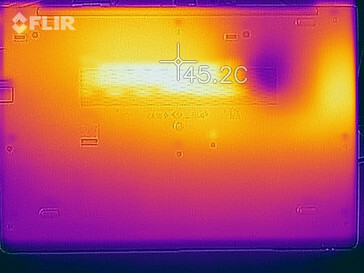 Our test device averaged 23.1 °C at idle and had a maximum idle temperature of 23.9 °C. Temperatures remain relatively cool under load too, with the top case remaining below 40 °C and the palm rest averaging 28.2 °C. The bottom case is the area where our test device gets hottest. Our test device reached an average of 37.8 °C in The Witcher 3 benchmark and 43.9 °C at its hottest point near the display hinge. 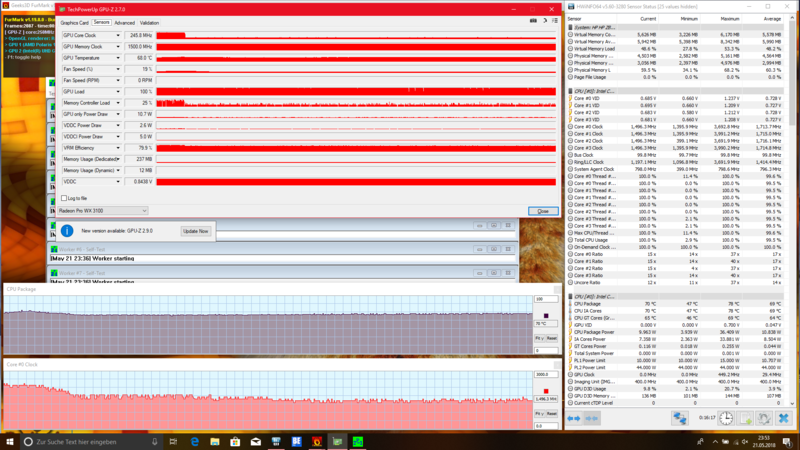 It may be worth noting that our test device got marginally hotter in The Witcher 3 benchmark than it did in our FurMark and Prime95 benchmarks. The FurMark and Prime95 stress tests highlight how HP has managed to achieve these thermals though. After a few seconds, the CPU clock drops to 2.2 GHz, reducing further to 1.5 GHz after only a few minutes. 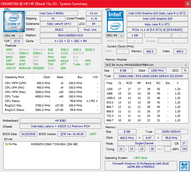 This is 300 MHz lower than the 1.8 GHz base clock speed. The GPU performs equally poorly, with its clock speed dropping from 750 MHz to 250 MHz after a short time. The cause of this heavy throttling is the temperature limit that HP has set. Core temperatures cannot exceed 70 °C, upon which temperature the CPU and GPU will throttle. This throttling affects everyday use, which we observed in our The Witcher 3 loop. Additionally, performing a 3DMark11 benchmark after our stress testing produces a lower result than when we tested the device from cold. (±) The average temperature for the upper side under maximal load is 34.5 °C / 94 F, compared to the average of 31.1 °C / 88 F for the devices in the class Workstation. (+) The maximum temperature on the upper side is 39.8 °C / 104 F, compared to the average of 37.1 °C / 99 F, ranging from 23 to 69.8 °C for the class Workstation. (+) In idle usage, the average temperature for the upper side is 22.6 °C / 73 F, compared to the device average of 31.1 °C / 88 F.
(±) Playing The Witcher 3, the average temperature for the upper side is 34.1 °C / 93 F, compared to the device average of 31.1 °C / 88 F.
(±) The average temperature of the palmrest area of similar devices was 27.8 °C / 82 F (-1.8 °C / -3.3 F). 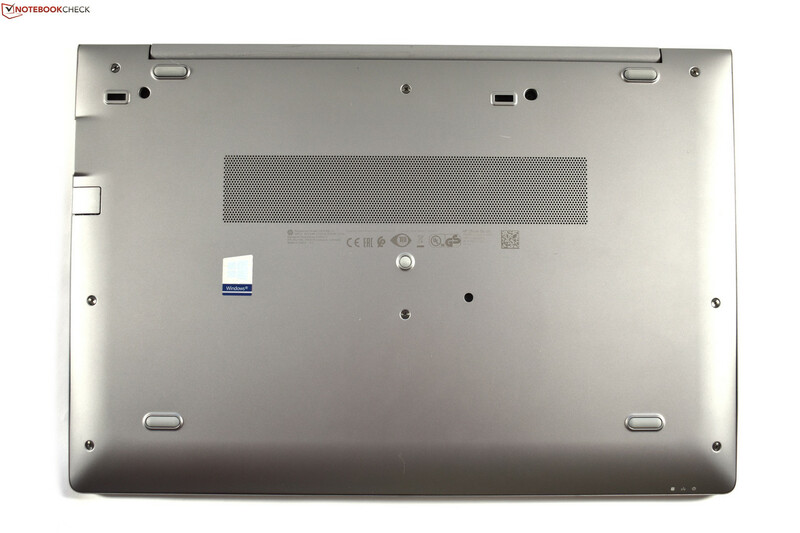 The ZBook 15u G5 has two speakers that are located above the keyboard. Good positioning does not equate to good sound quality though. While the quality is not abysmal, it is a bit tinny and there is some distortion at high volumes. The maximum volume is respectable at 83.6 dB(A) and is around 3 dB(A) louder than the ThinkPad P52s. We would recommend using headphones or external speakers if you plan to listen to music or make video-conferencing calls for extended periods of time. Sound via the 3.5 mm jack is sufficiently loud. Arguably, power consumption at idle is the most important factor when considering a device’s power efficiency in daily use. A high idle value necessitates charging your device far more frequently, which can be frustrating if you are away from an outlet. The ZBook 15u G5 performs well in this regard compared to the class average for workstations thanks to its ULV processor. Our test device has a minimum idle consumption of 3.2 W, which is far lower than the 14.3 W minimum idle consumption for average workstations. An advantage of ULV CPUs is that they support USB Power Delivery (PD) over USB Type-C up to 100 W. Typical workstations exceed 100 W consumption so they continue to use proprietary power connectors. The ZBook 15u G5 has an advantage here as it uses an industry standard port to charge and thus can use other chargers. Our test device consumes a maximum of 71 W under load, which is at the upper limit of PD performance. The included power supply is rated at 65 W, 6 W fewer than the ZBook 15u G5’s maximum power draw. This should not be a problem in practice though as the CPU can only maintain peak performance for 28 seconds. 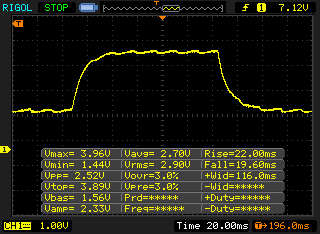 The average load power draw is 62 W, so the device should still charge even under full load. The ZBook 15u G5 has a 56 Wh battery. This is 5 Wh larger than its predecessor and is of a typical size for Ultrabooks. More powerful workstations typically have large batteries. This doesn’t mean they have better battery life than the ZBook 15u G5 though as they typically consume far more power thanks to their higher wattage CPUs. The only exception to this is the ThinkPad P52s, which has an Ultrabook CPU and footprint but comes with a 95 Wh battery thanks to its extended PowerBridge battery. Clearly, the ThinkPad P52s has far better battery life than the ZBook 15u G5. However, the ZBook 15u G5 performs well, lasting 8 h 34 m in our practical Wi-Fi battery test. In this test, we run a script that simulates the load required to render websites. Our test device also lasted 10 h 23 m in our H.264 battery life test during which we run an H.264 video on a loop. These are good runtimes, albeit not outstandingly so. They are better than the ZBook 15u G4 but marginally less than the EliteBook 850 G5. Our test device took 133 minutes to charge. 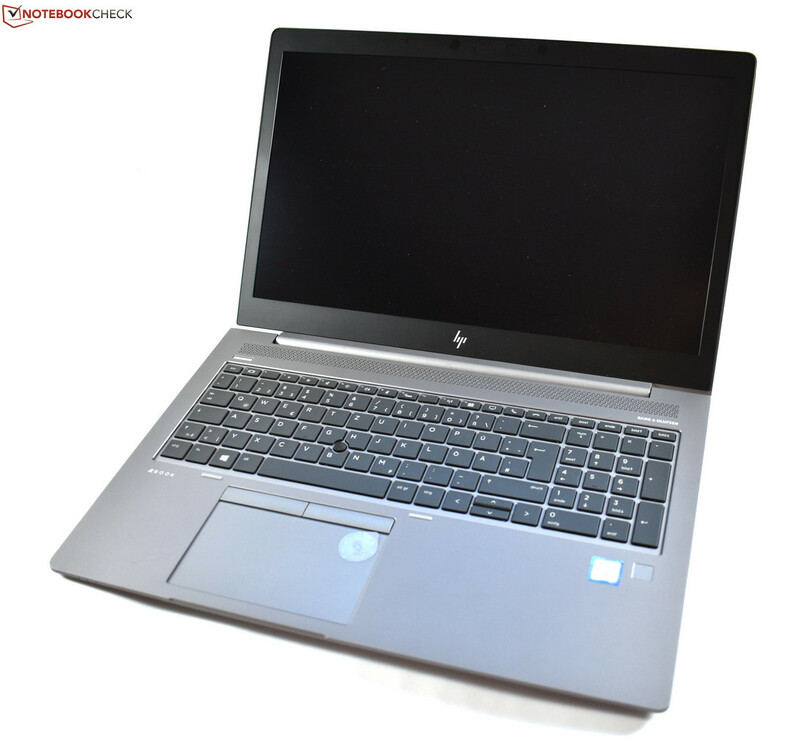 The HP ZBook 15u G5 appears to address the reasons for which we criticized the ZBook 15u G4 by packing an updated GPU and a more powerful quad-core CPU. The ZBook 15u G5 is based on the EliteBook 850 G5, which is certainly not a bad thing. 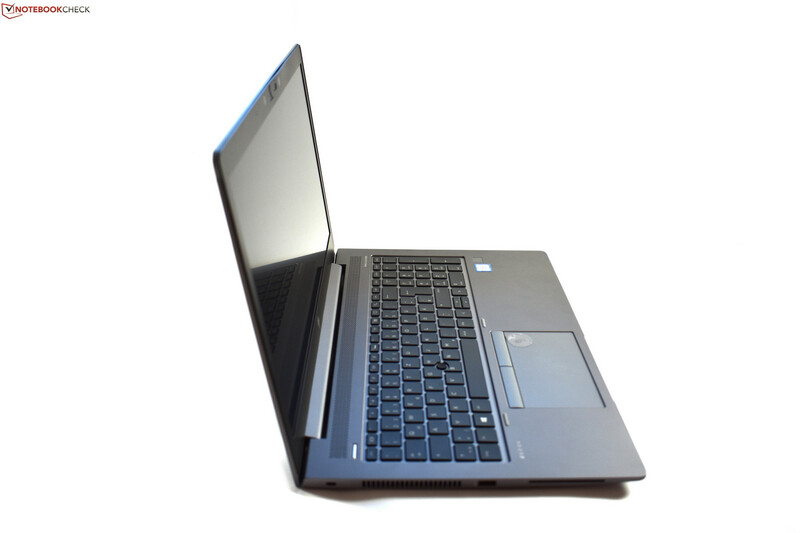 The EliteBook 850 G5 has some impressive qualities like the high-quality metal case and the decent touchpad. 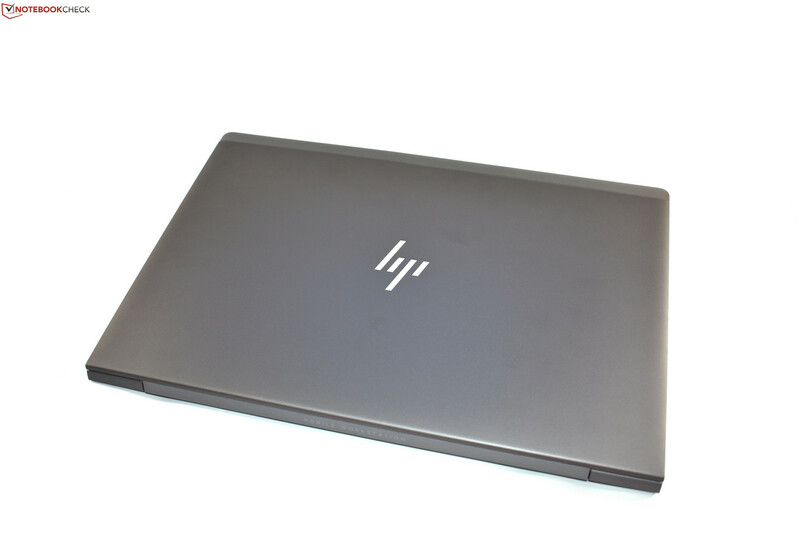 HP has even replicated the EliteBook 850 G5’s low surface temperatures and the decent selection of ports and security features. The ZBook 15u G5 has the same warranty period as the EliteBook 850 G5 too. 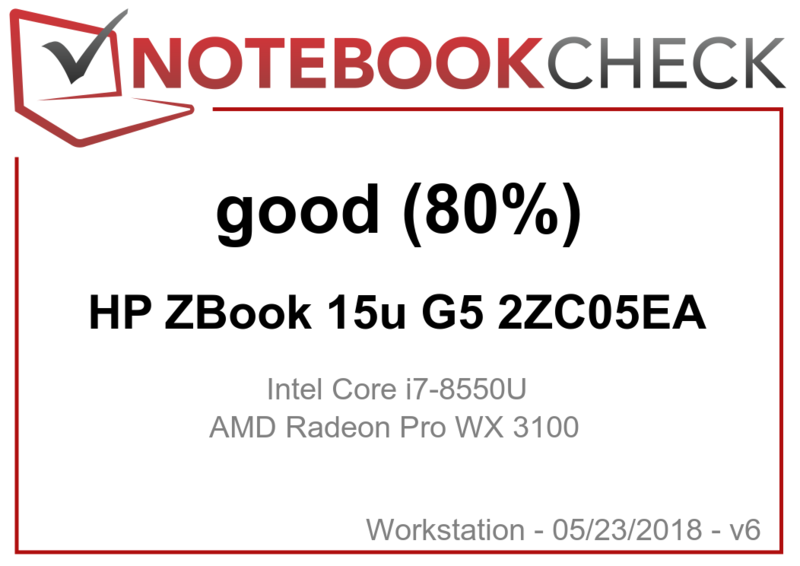 In effect, the ZBook 15u G5 is an office notebook with an ISV-certified GPU. This does not qualify the ZBook 15u G5 as a true workstation. The ZBook 15u G5 only has low surface temperatures because of conservative temperature limits. These limits and the weak cooling system combine to produce weak CPU and GPU performance to the extent that the Core i7-8550U is outperformed by the weaker Core i5-8250U in the EliteBook 850 G5. Moreover, the GPU fails to reach its full potential as the system thermal throttles before it can do so, resulting in the Radeon Pro WX 3100 being outperformed by its predecessor in certain benchmarks. This frustrating experience is made worse by the annoying high-pitched fan and the dreaded coil whine. 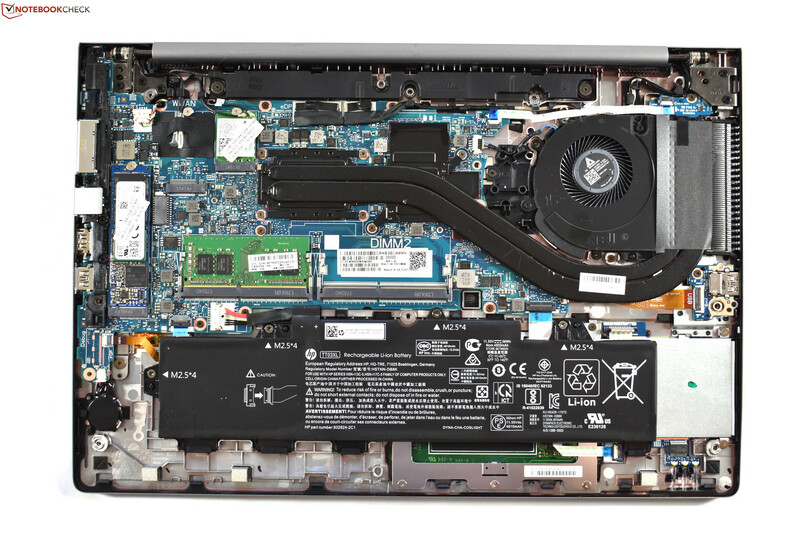 In short, the ZBook 15u G5 reinforces the notion that a good workstation cannot be based on the reference design of an office notebook. These are not the only problems either. The display in our test device is just not good enough for a device that costs 1,750 Euros (~$2,059). The color-space coverage and brightness are too low to be used in a workstation. We also expected to see an SD card reader and a better version of PointStick than the one used in the EliteBook 850 G5; PointStick is not at the same level as the ThinkPad TrackPoint. Finally, we would expect to see at least two M.2-2280 SSD slots in a 15.6-inch workstation rather than the one that is included. One is fine for office notebooks but not for workstations, particularly when there is space for an additional M.2-2280 slot. 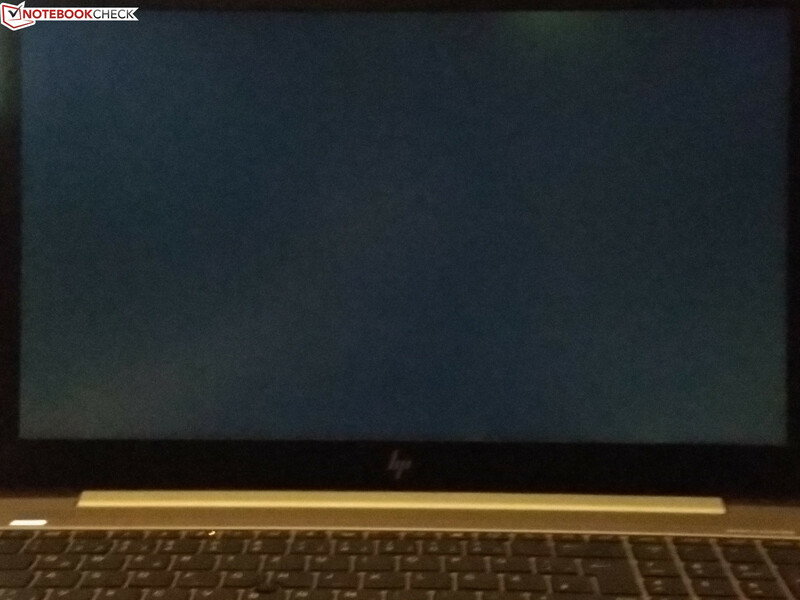 The HP ZBook 15u G5 severely throttles under load, which is something that we do not expect to see from a device marketed as a workstation. 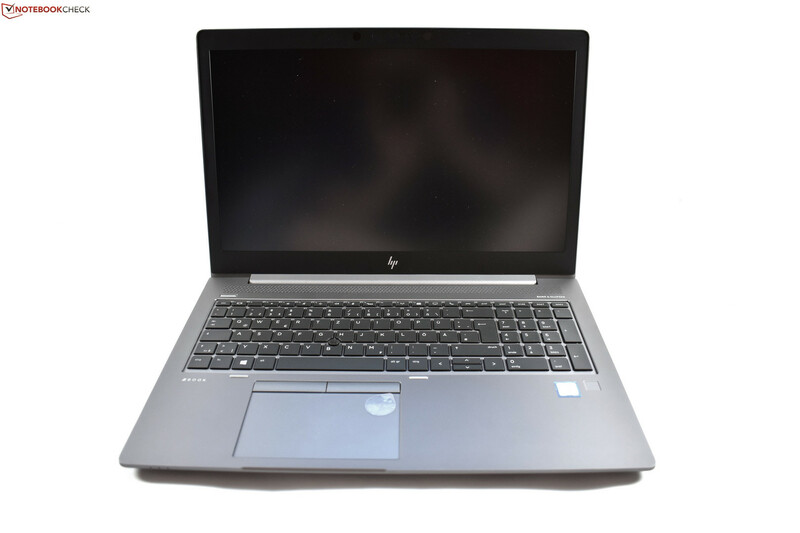 In summary, it is unclear for whom the HP ZBook 15u G5 is designed. The device falls short as a workstation because it is considerably underpowered compared to other workstations and has a display that is unsuitable for professional use. Equally, the ZBook 14u G5 is a better choice if you favor mobility but want to buy a ZBook. Moreover, there are better choices of office notebook too, like the cheaper EliteBook 850 G5. 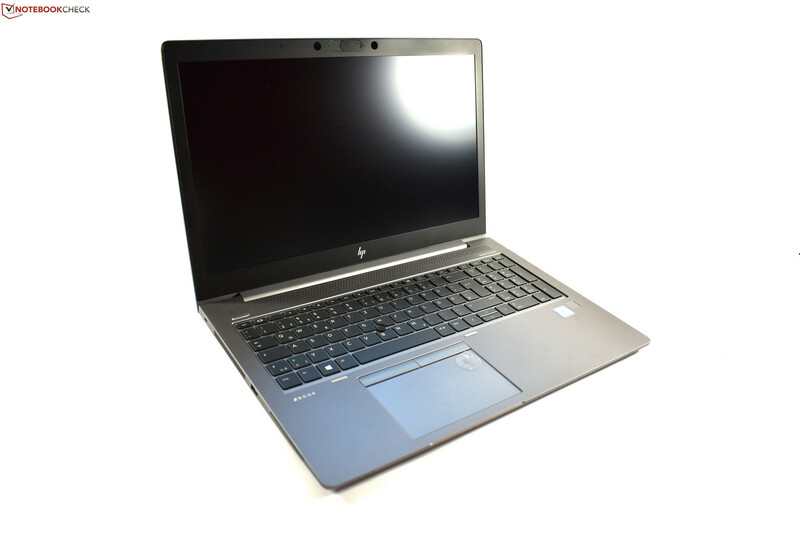 Overall, we cannot recommend the HP ZBook 15u G5 because of its considerable shortcomings as a workstation.